I lead photo workshops in lots of beautiful, exotic places, but I particularly look forward to the Eastern Sierra workshop for the variety we get to photograph. Mt. Whitney and the Alabama Hills, Mono Lake and Yosemite’s Tuolumne Meadows, lots of fall color in the mountains west of Bishop and Lone Pine, and the ancient bristlecones in the White Mountains, east of Bishop. It’s the opportunities to photograph the mountains surrounding Bishop that most stimulate my creative juices. Each fall the small lakes, sparkling streams, and steep canyons west of Bishop are lined with aspen decked out in their vivid autumn yellow. Contrast that with the arid White Mountains east of Bishop, where virtually nothing thrives except the amazing bristlecone pines. The bristlecones are among the oldest living things on Earth, and they look it. 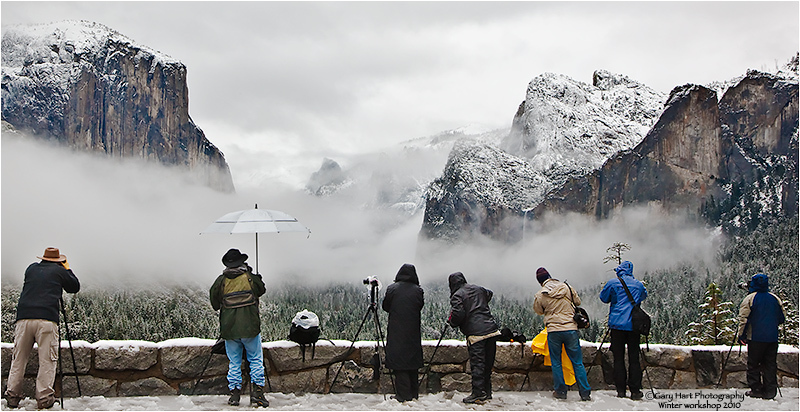 The character they’ve earned by enduring up to 5,000 years of cold, wind, thin air, and water deprivation makes them ideal photographic subjects. There’s wonderful texture in the bristlecone’s twisting trunk and branches, but sometimes I like to turn off the texture with a silhouette that emphasizes the gnarled shape. 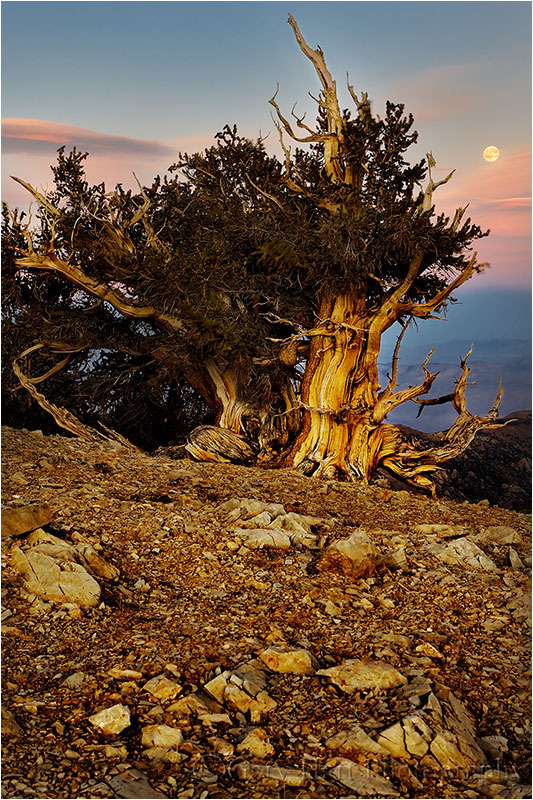 The bristlecone here clung to a steep hillside in the Schulman Grove of the Ancient Bristlecone Pine Forest. I was there with three friends on a moonless, late September night several years ago. 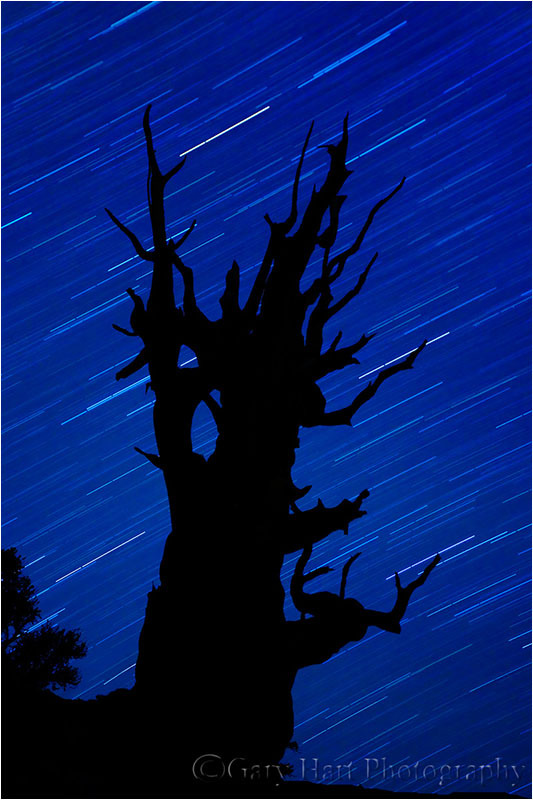 They wanted to light-paint the tree, but I wanted something that just emphasized the tree’s shape against the stars. With our shots set up, I delayed my exposure for a few seconds while they hit the tree with a bright flashlight, clicking as soon the world went dark. Then we just sat and waited in the chilly air, enjoying the sky, laughing quite a bit, but sometimes just appreciating a silence that’s impossible to duplicate anywhere in our “normal” (flatland) lives. We had long exposure noise reduction turned on, so we couldn’t see our results until our cameras finished their processing. The pictures didn’t pop up on to our LCDs until we were halfway back to Bishop, but I was driving and had to wait until we got back to town. We pulled into Bishop, tired and hungry, so late that we had a hard time finding anything open, but everyone was so pleased with their images that even Denny’s tasted good. In my previous post I wrote about California’s extremes. I used Badwater in Death Valley to illustrate, but of course there are many more examples. Case in point: the bristlecone pines of the White Mountains, just east of Bishop, across the Owens Valley from the Sierra Nevada. The more heralded, heavily traveled Sierra gets most of the rain and snow from the Pacific, rendering the White Mountains a high elevation desert. With very little water to sustain foliage, fierce winds scour the White’s rocky surface unchecked. Water (and foliage) also moderates temperatures (lower highs, higher lows)–without water’s moderating effect, high temperatures in the White Mountains are higher and low temperatures are lower than corresponding elevations in the nearby Sierra. 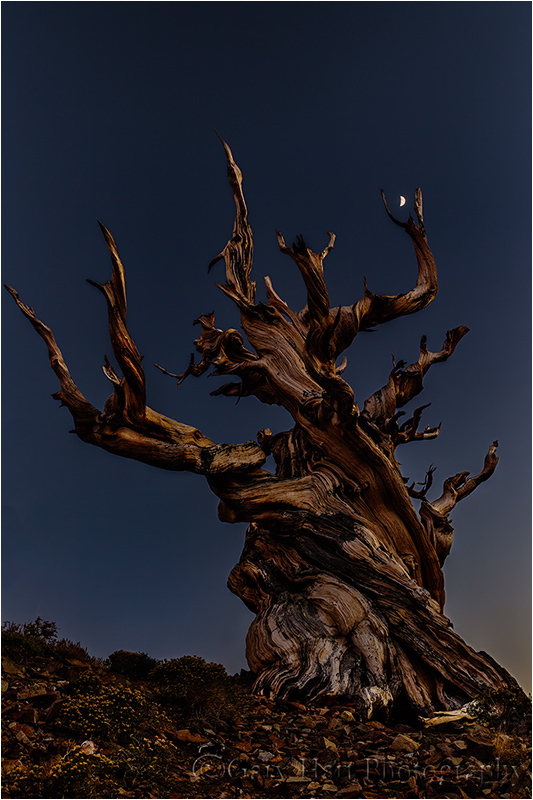 Enter the bristlecone pine, a hardy conifer that has evolved to not only survive in these extremes, it thrives. Thrives to the point that it is generally acknowledged as the oldest living thing on earth (older, even, than Larry King). 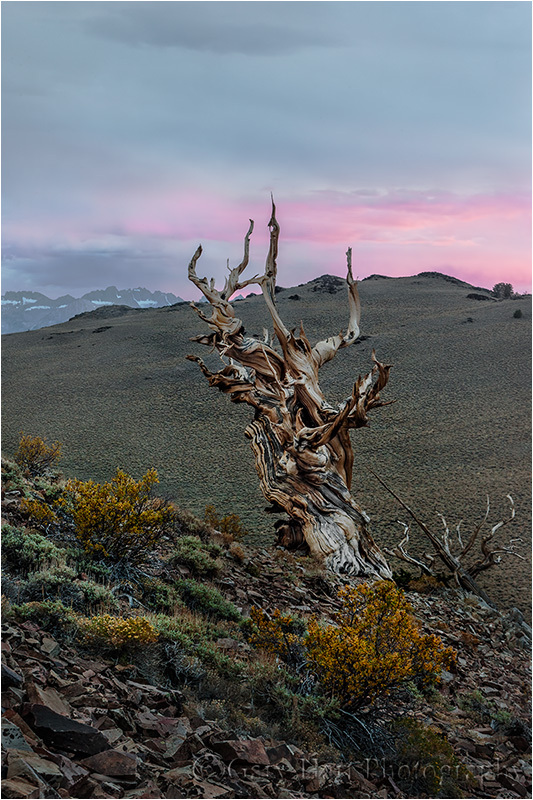 Some bristlecones approach 5,000 years old; the tree in this image is around 4,000 years old, give or take a millennium (due to, believe it or not, concerns about vandalism, individual bristlecone ages aren’t revealed). The Schulman Grove Discovery Trail is a one mile loop with great access to some magnificent trees. It’s a very well-marked, heavily used trail, but it’s quite steep. And at over 10,000 feet elevation, it will definitely test your lung capacity. At just about the halfway point of the trail, you’ll find a magnificent bristlecone pair, well worth the effort to get out there. The trail here loops around these trees, providing 270 degrees of perspective. The most popular view here, the view that seems to attract the most photographers, is close and looking up at the trees against the sky. But this evening I liked that the (often obscurred by haze) Sierra crest was clearly visible, and saw that the sky had potential for color, so I picked a more distant vantage point up the trail a bit. From there I could isolate the tree against the mountains and compress the distance somewhat with a moderate telephoto. Using some scruffy yellow shrubs to anchor my foreground, I decided a vertical composition allowed me to compose the tree a little tighter. It was about 75 feet away, which meant at f16 and 75mm, focusing just a little in front of the tree gave me sharpness from 25 feet to infinity (as reported by the hyperfocal app in my iPhone). 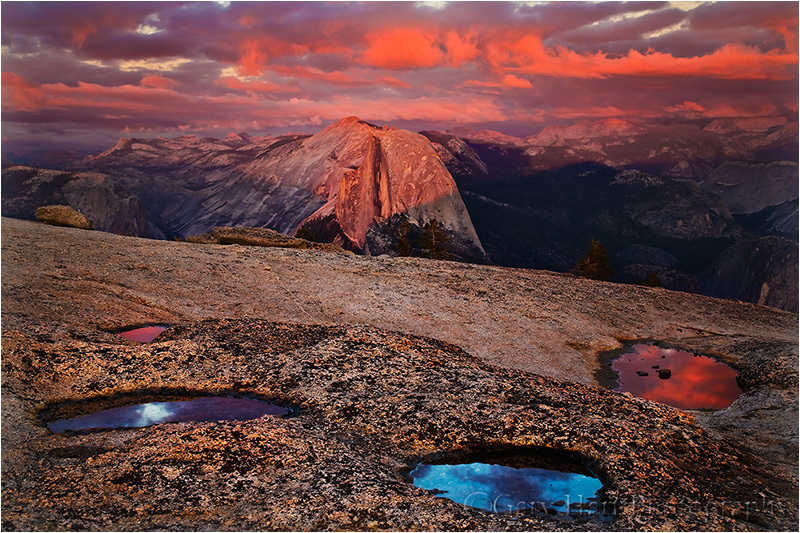 The color came late, after many photographers had packed up and headed back to the visitor center. While the sunset didn’t paint the entire sky, it very conveniently peaked in direct line with my composition. I love it when everything comes together.